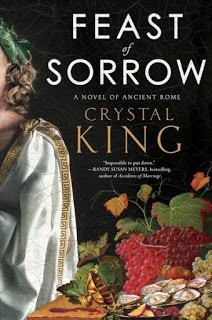 My last post highlighted the December/January Cook the Books selection, Feast of Sorrow by Crystal King. I felt like I got bogged down in some of the cruelty and indulgences of the novel and did not allow myself to be inspired by the food. Thrasius’ tale is one of inspiration as well as King creates a character that triumphs against many odds and truly has the luck of the gods with him during his life journey. Born a slave in ancient Rome, Thrasius’ cunning and talent in the kitchen allowed him to not only survive, but to also prosper. Despite all the pain and suffering that is around him, he finds love and happiness ultimately. Chop leeks, coriander, (mix with) cumin, raisins, and flour. Put the mixture in the middle (of the beet leaves); tie up and (boil). Serve in a sauce of liquamen, oil and vinegar. From these two references, I decided to create a salad using the flavors described. I added farro, an ancient grain, that Thrasius would have also had in his larder. Use this dressing on any salad or drizzle on grilled chicken. Toast coriander, cumin, and fennel seeds in a dry small skillet over medium heat, tossing, until fragrant, about 3 minutes. Let cool. Place toasted spices in a spice blender and grind. Place ground spices in a bowl with vinegar and mustard; whisk together. Drizzle in olive oil while whisking to incorporate. Season with salt and pepper. Set dressing aside while you assemble the salad. This recipe combines an ancient grain with beets, beet greens, leeks and herbs. Heat olive oil in a small skillet and saute leeks until limp. Season with salt and pepper. Set aside. Add the roasted sliced beets, chopped beet greens, sauted leeks, raisins and parsley to the farro. Toss to combine. Toss with the Spiced Vinaigrette. Serve. (Salad is better the next day.) Re-season if needed with salt and pepper. This ancient inspired recipe is much better than the “authentic” honey cakes I made for the last Feast of Sorrow post. I don’t know if Thrasius would have served this to Apicius as a gustatio and if Apicius would have approved; however, in our house, this salad will appear again. 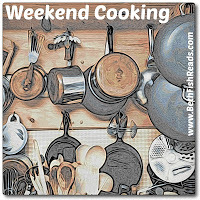 I am linking up with Beth Fish Reads’ Weekend Cooking. I am the host for this round of Cook the Books. You can read the announcement post here. You still have a bit of time to participate. The deadline for Feast of Sorrow is January 31, 2018. Anyone can join in by reading the current selection, preparing a dish inspired by its contents, and writing about it. Let me know when your entry post is up by commenting on this post and/or sending me an email at eliotseats@gmail.com. 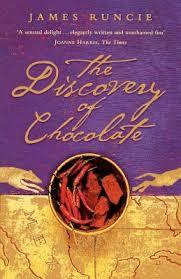 If you’ve run out of time to participate this month, please note that Simona (bricriole) is hosting The Discovery of Chocolate by James Runcie for February/March. Look for her announcement post soon at Cook the Books. If you like historical fiction, this novel promises another excellent read, set during the time of discovery and Cortés’ travels to the New World. I’m again linking up with January’s Foodies Read. 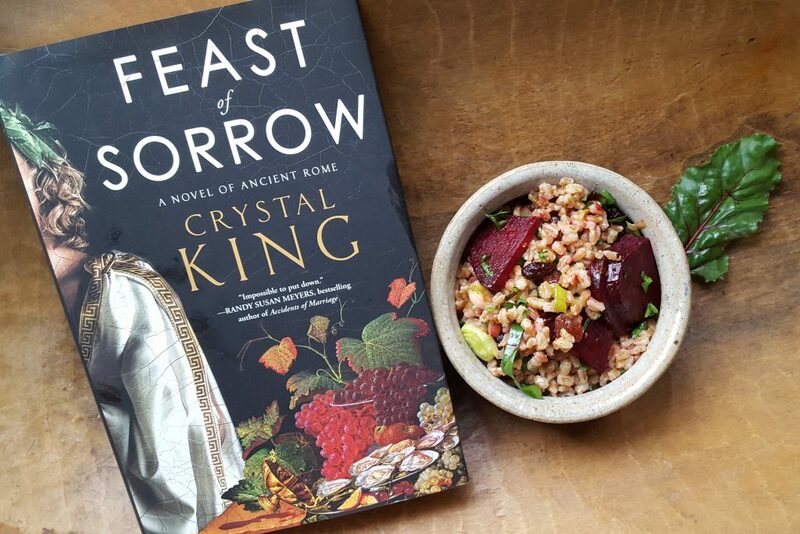 That beets and farro dish looks awesome. I just got this book from the library — I hope I get around to reading it before I have to return it. I hope you like it. It has seemed to be a favorite with the CTB members thus far. The salad sounds and looks great! I must try your spiced vinaigrette for my next salad. I’m keeping that vinaigrette recipe in our repertoire. .
“Farro” seems to have quite a few meanings — I just read a couple of articles about all the different types of grain that have that name in various geographic locations. Really interesting. I haven’t tried it, though I do use wheatberries which are similar. I’m always amused by the term “ancient grains” because in fact wheat is very, very ancient, and some of the ones that have this name are actually more recent. I guess “farro” is sort of in between. Ha! Yes, wheat (and other grains) are very very ancient. Got to love marketing trends. Another good pick for representation of this marvelous book! I’m looking forward to the roundup. oThe salad sounds good, haven’t had farro for a long time. The book, not really my kind of read. 🙂 Thanks for the recipe and review! Thanks, Pam. It’s a good book, though. 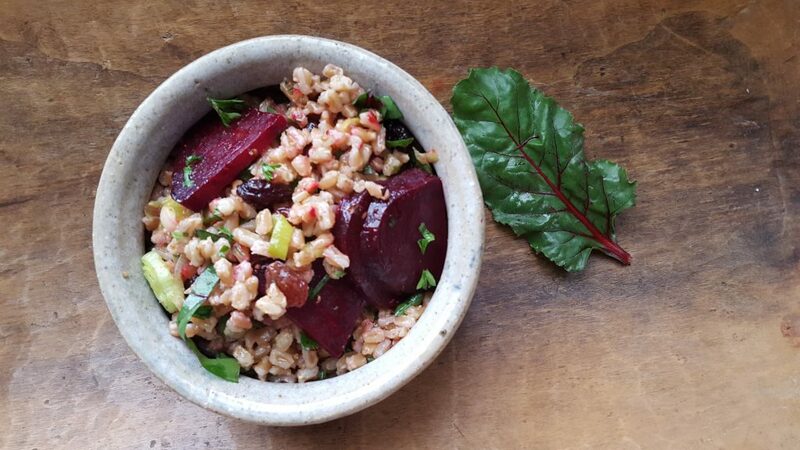 The beetroot and farro dish appeals and I would love it as my lunch to take into work. My husband would also approve. I am hoping to read more books this year, a change from cookbooks so may join in one day. I hope you can join up one day. This is a good dish and could work with a lot of different vegetable combos. Oooh, if you stuff some you must post it, Claudia! This salad sounds wonderful Deb…I loved the novel even though it was at times cruel and sad…such was the life of the slaves. I loved it, too, Wendy. It was just a dark tale. I guess it hit me hard because I connected with the characters so much. I considered that recipe in Apicius as well, since I like beet greens a lot. I like how you let it inspire your salad recipe. Nice! I need to revisit this salad with some kale and chard as I have a lot of it right now.